Thousands of protesters in and around Tahrir Square in downtown Cairo clashed for a second day on Sunday with Egyptian security forces, with some 18 arrested in the morning hours. Protests are also being held in a number of Egyptian cities. 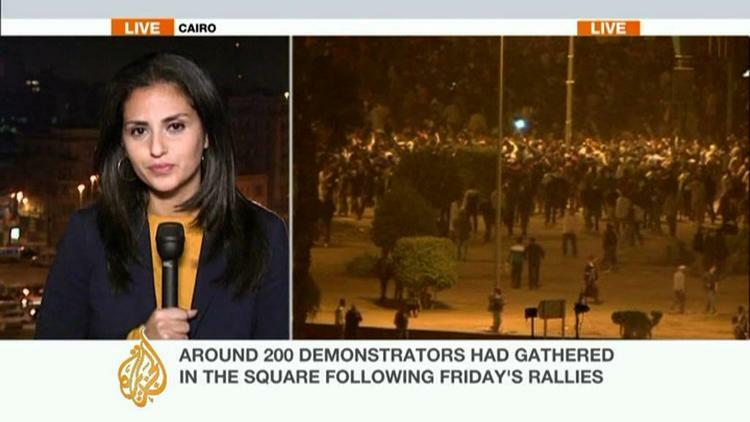 On Saturday, one person was killed and hundreds were wounded at Tahrir Square as security forces and protesters clashed when the government attempted to clear the square. Another protester was killed in Alexandria. Some Egyptians are saying that deposed dictator Hosni Mubarak has been revealed still to be in power (i.e. his officer cronies have the same mindset as he did). Al-Masri al-Yawm likened the carnage to the attempted crackdown late in the Mubarak era last February. Last month US Secretary of Defense Leon Panetta visited Cairo and pressured the Supreme Council of the Armed Forces (SCAF) to abrogate the state of emergency, which was instituted in 1981 and sets aside constitutional personal liberties, on the grounds that it would detract from the legitimacy of the elections if they were held under such draconian laws. The current round of protests was sparked by the SCAF’s constitutional guidelines, conveyed by deputy interim prime minister Ali Silmi. These guidelines would keep the military budget secret, allow the military to appoint 4/5s of the members of the constituent assembly that will write the constitution, and would permit the military to veto any articles of the constitution before it went to a national referendum. Leftists were outraged by the prospect of heavy-handed military intervention in governance. Muslim fundamentalists were upset because they suspected that the military will use its veto over articles in the new constitution to keep Egypt a relatively secular state. Protesters are also angered by the trial of civilians in military courts. Elections are scheduled for November 28, and some wonder whether this turmoil will cause them to be postponed. It is hard to see, however, how postponing the elections that would bring legitimate representatives to power could possibly be a good thing. One of the problems is that the current authorities are all transitional and unrepresentative.